Unless he wants to try his luck before the U.S. Supreme Court, a backup dancer for Cypress Hill [not pictured, above] won't be getting $250 million-or any money-from the makers of Grand Theft Auto: San Andreas. A California appeals court has upheld an earlier ruling against the dancer's claim that the character of Carl "C.J." Johnson, the game's protagonist, was based on him. There was more to this than you might think, even if a $250 million demand is, shall we say, optimistic (and likely made to cause publisher Take-Two Interactive to seek a settlement without a trial.) Michael "Shagg" Washington, the plaintiff, met with developers in 2003 and discussed details of his past as a gang member in Los Santos Angeles. His photo ended up in Rockstar's files, and his name is listed as a model in the game's credits. But connecting all that to C.J. himself was a bit of a stretch, according to a district judge, who was upheld on Wednesday by the state Court of Appeals. The original judge said Washington was relying solely on C.J. 's physical appearance in the game to make the connection. "[T]hat appearance is so generic that it necessarily includes hundreds of other black males." Unless Washington also transformed himself from a 112-pound rail into a 240-pound destroyer with a trapezius the size of a Thanksgiving turkey, in just two weeks at the Ganton Gym, I'd be inclined to agree with the judge. The No Doubt avatars…perform rock songs, the same activity by which the band achieved and maintains its fame…[Nothing in the video game] transform[s] the avatars into anything other than exact depictions of No Doubt's members doing exactly what they do as celebrities. 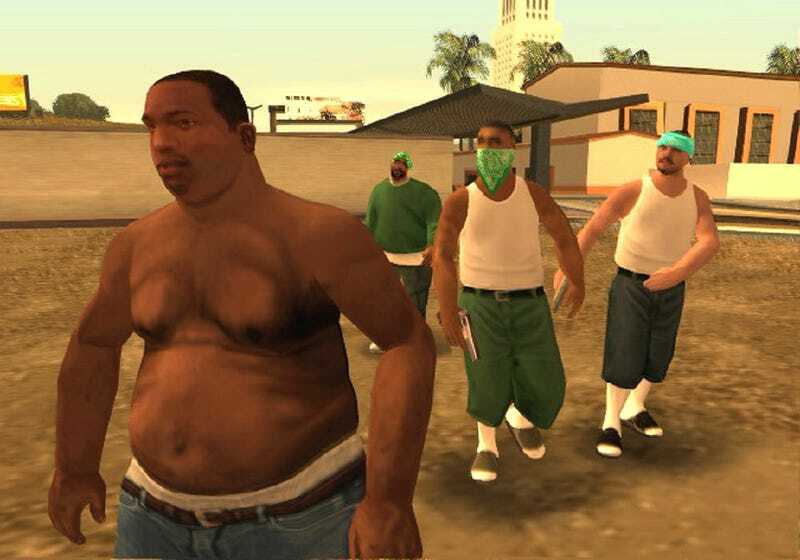 Here, however, Washington has presented no evidence demonstrating that the plot or characters of GTA: San Andreas have any relevance to his life or his purported fame.